what is the difference between "will" and "going to"
When to use the future tense? We use the future tense when we want to talk about future actions or happenings. I will write to John. I am going to finish my work soon. 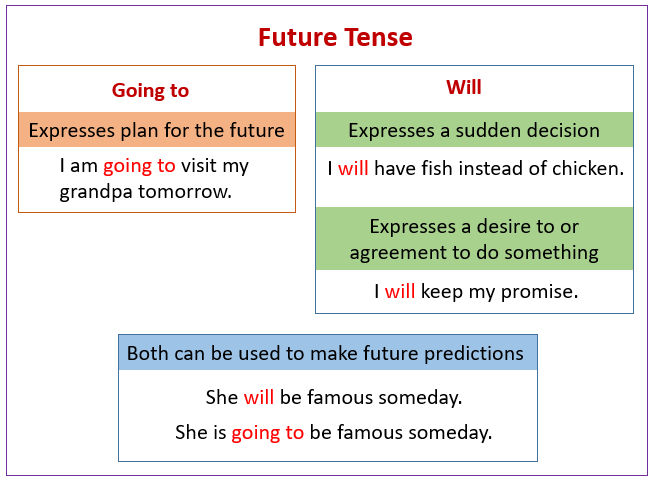 The following diagrams show examples of Future Tense and the differences between using "Will" and "Going to". Scroll down the page for more examples and explanations. I am going to visit Sally. We are going to be back for dinner. We usually use will + verb when the situation is unplanned or in formal writing. There are two ways to talk about the future in English: will/won't and going to. How to make the future tense using "will" and the simple form of the verb? Pronunciation practice is important with the contractions. How to make the future tense with "going to"? How the future tense is used in conversation? Are you confused about if you should use 'will' or 'going to' to talk about the future? Simple future tense rules for using 'will" and "be going to" in making future tense sentences. More discussion of "will" and "be going to" for making simple future sentences.